A Tupolev Tu-22M3 strategic bomber in 2016. 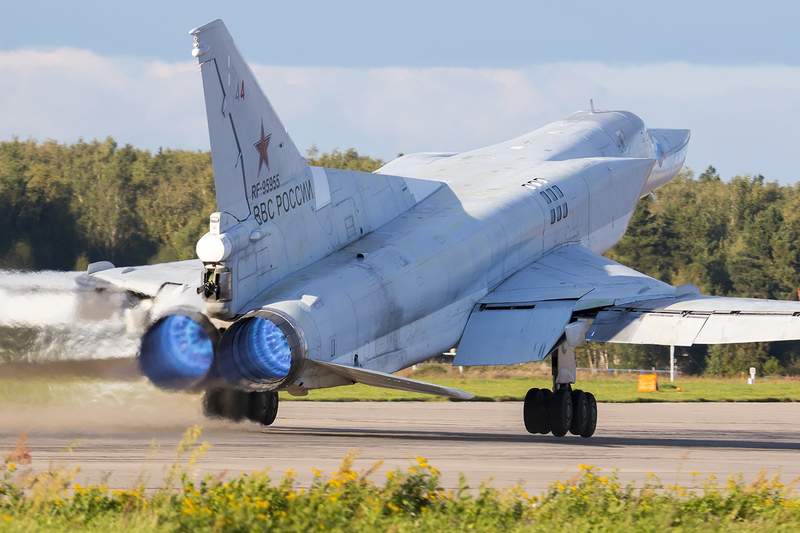 Russian defense officials say they are deploying “squadrons” of Tupolev Tu-22M3 Backfire bombers as a counter to U.S. Navy Aegis Ashore missile defense installations in Poland and Romania, according to a report in Russian state-controlled media on Monday. In comments made to the TASS news agency, Russian lawmaker Viktor Bondarev said Russia was sending the bombers to the Gvardeyskoye airbase in Crimea in a move to directly counter the U.S. Aegis Ashore missile defense installations. The strategic bombers are capable of carrying nuclear weapons, but it’s unclear if those weapons would come with the bombers if they deployed to Crimea. The announcement comes shortly after Russian President Vladimir Putin visited the region to celebrate the five-year anniversary of the forced annexation of the Crimea. A Pentagon spokesperson told USNI News on Monday that U.S. and allied forces were closely monitoring movements on NATO’s eastern flank and “posturing as appropriate” without specifically addressing the claims Russia was moving bombers into Crimea. Aegis Ashore is based on radar and missile systems found aboard American guided-missile destroyers and cruisers but configured as a ground installation. Each site features an AN/SPY-1D(v) air search radar and a battery of two dozen Standard Missile 3 ballistic missile interceptors. Like the four ballistic missile defense-capable Arleigh Burke-class destroyers stationed at Naval Station Rota, Spain, the sites in Romania and Poland can detect, track, target and launch interceptors to take on a ballistic missile threat. While the Aegis Ashore batteries field SM-3s, they could be outfitted with other weapons. The forward-deployed destroyers and the two ground installations were part of the Obama Administration’s European Phased Adaptive Approach to missile defense that was designed to interdict small numbers of missiles from countries like Iran. However, some have said the role of the Aegis Ashore installations could change after the U.S. departed the Intermediate-Range Nuclear Forces treaty, which Russia formally suspended its participation in on March 4. Abraham Denmark, director of the Asia program at the Wilson Center and former Defense Department deputy assistant secretary of defense for East Asia, said the installations could be shifted from a Middle East threat to a direct threat against Russia. Last month, Chief of Naval Operations Adm. John Richardson said the two installations send a message to Russia. “That capability makes a tremendous statement,” he said.